We told you it was going to be a pretty awesome tablet and price back on the #BigTimeShow, didn’t we? Well now we can finally reveal the official SRP of the new Asus Memo Pad HD7 tablet – the one with the Quad-Core MediaTek processor and 7” HD IPS Display. And what do you know, its going for only PHP 6,995 for the 8GB version and PHP 8,995 for the 16GB version. Since the tablet does have a MicroSD card slot we doubt the storage is going to be a problem either way – so its definitely going to be one of the most affordable Quad-Core tablets in the market today. (And you have the Asus branding backing it up as well.) But pricing news isn’t the only thing we’re going to share with you today, we have a full review (that’s right) of the tablet for you as well. Check it out and some more specs, after the break! 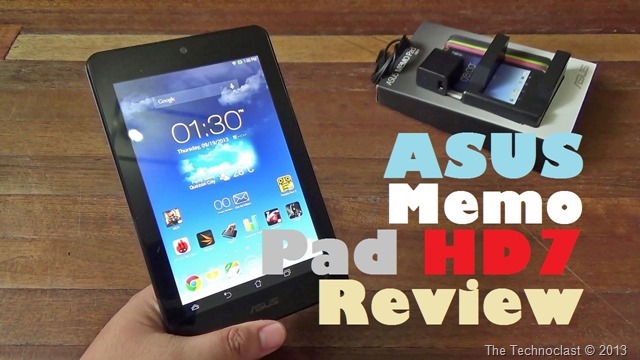 The Asus Memo Pad HD7 Gets 4 out of 5 Stars! The Asus Memo Pad HD7 is a strong recommendation for tablet consumers on a budget. Even if it goes against local tablet competition it still easily comes out on top. The camera outshines anything in this price range, performance is way above average, and even the HD screen and Asus customizations sets it on par feature-wise with brands that punch way above PHP 10k. With all those considered, complaints about the slightly less premium build (which we might add is still more premium than any local brand tablet) is bordering on nitpicking at this point. Suffice to say, the Memo Pad HD7 is going to be a great stocking stuffer or student / dad purchase this coming Christmas season. Update: The Memo Pad HD7 should be showing up in major retailers today (October 2, 2013), and will be arriving in more regional stores shortly. Check them out if you’re near one! Note: You can check out the #BigTimeShow episode where we talked about the Asus Memo Pad HD7 in-depth for more of our impressions about it! Does it allow apps to be installed to SD card? I’ve read on some other website that it doesn’t. Can you confirm this?